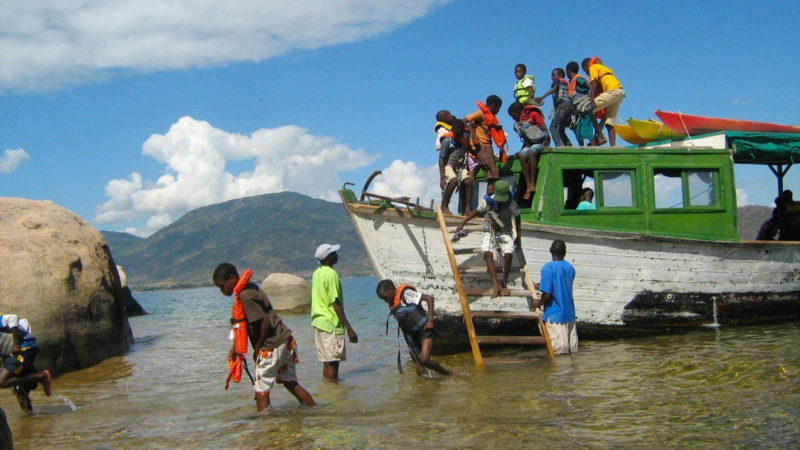 Kayak Africa has been offering educational trips to Mumbo and Domwe to local schools for three years now in the hope of fostering a sense of community involvement and understanding of the reasons why the islands in the National Park are precious, protected areas. On 17th June, 2013, Kayak Africa offered Cape Maclear Primary School a day trip to Domwe Island for members of the school’s wild life club. The school selected thirty pupils and six teachers to go on the outing. The Department of Parks and Wildlife also sent an assistant to teach the students about wild life conservation and waste management. They were given a tour of Domwe Island and a discussion about how we operate a sustainable camp there by Kayak Africa’s head guide and manager, Edward Stefano. While on Domwe the pupils enjoyed learning to kayak and snorkel, went on a hike and a boat cruise and then enjoyed a hearty lunch and cold drinks in the dining area. The group came back very thrilled with their adventure.